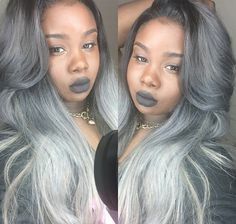 What do you think of black girls with gray, silver or white dyed hair? I think on any brown skin tone, not just black girls but like Asians who are Pakistani Indian etc... Most hair colors look really nice. Brown skin tones of all shades, look good with most colors on hair and clothes. I think it looks kind of strange. Just doesn't go well with dark skin in my opinion. Which pair of shoes should I get? Do you ever feel ugly and unattractive? Do You Think Plastic Surgery Would Make You Happier? Which outfit is cuter? What Do You Think Of Billie Eilish's Style? Not a big fan, looks unattractive to me. If you like it, don't let anyone stop you though. 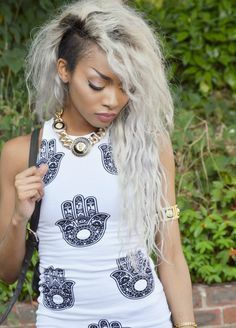 Home > Fashion & Beauty > What do you think of black girls with gray, silver or white dyed hair?